5th – 7th July 2017 (Thursday– Saturday) : 4.00 p.m – 12.00 p.m.
8th July 2017 (Sunday): 4.00 p.m – 10.00 p.m. Please note, Egri Bikavér Festival facilitates payment by cash only. 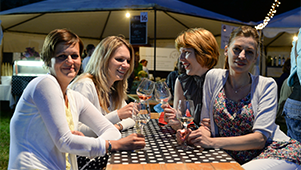 Paying for wines and dishes during the Festival times can be made at the tents, according to the regulation of law CXXVII, 2007 about Hungarian VAT. Wine tasting glasses with logo, glass holder wallet and mineral water can be purchased at the cash-desks. The exact location of cash – desks are marked on the Festival map. At the wineries the countervalue of 50 ml, 100ml and bottle of wines are displayed. Food and cheese tasting coins all cost minimum 1500 HUF. The wine tasting glass with logo 'I ♥ Egri Bikavér' with volume 405 ml costs 800 HUF. The glass holder wallet with logo 'I ♥ Egri Bikavér' costs 500 HUF. All visitors enter the territory of the Festival has to accept and compulsorily observe all rules set in the written policy. 1. 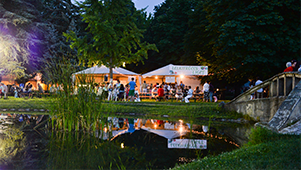 During the opening hours of the Festival, first aid service operates next to the tennis courts also at the place of blood – transfusion service at Klapka Street gate. 2. All over the territory of the Festival free WI-FI service is available. 3. 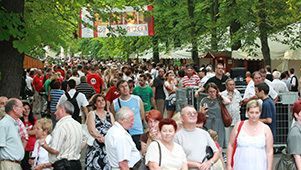 The security and public order of the Festival is ensured by Security Service day and night. 4. In case You get lost or helpless, our colleagues are at your disposal at information points and cash-desks. 5. Lost and found properties should be handed in or searched at the central information desk at the side of the lake. 6. Voice recording and photos could be taken during the Festival whereas any of the visitors are able to appear. However they cannot claim the organisers or producers, photographers also the legal users of those. 7. Voice and video recordings can only be taken with the written permission of the organiser! 8. Organisers do their best to the safe organisation however do not take any responsibility about the damages caused by visitors. 9. At the Festival area it is forbidden to do any commercial or advertising activity without the written permission of the organisers. 10. It is not recommend to bring your pet into the Festival area. We advise you to leave them at home or at pet pension. In case it is not possible, only calm pets are welcome holding them on lead, wearing muzzle and ticket. 11. It is forbidden to ride a bicycle at the Festival area! 12. During opening hours of the Festival, all mobile toilets are free of charge. 13. On Friday and Saturday, from 4.00 – 9.00 p.m we organise blood – transfusion service at the Klapka street gate of Érsekkert. Please bring your ID and social security card. After blood giving we say thank you with a glass of Egri Bikavér. 14. In case of bad weather the Festival is open. 15. Organisers keep the right of programme changes!